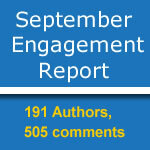 September Engagement Report ~ 191 Authors, 505 comments ! →September Engagement Report ~ 191 Authors, 505 comments ! Well it’s time for September engagement report on this blog. As you can see, there’s been a drop in the numbers of comments and authors. The simple reason is that I have been less active in blog hopping the past few weeks. I have focused more on BroadedNet, the blog promotion platform for traffic without SEO or Social Media. I have also upgraded MyCommentAuthors to version 1.4 and the table below is part of this new version. So be sure to upgrade in WordPress dashboard before generating your own list. Check out this post for more on the new features. So thank you everyone for being part of this blog again in the month of September 2014. I love seeing you around and appreciate every second you spend on this blog. October is another month and I hope we spend more time together. I always say better days are yet to come. In everything you do this new month, my advise is you try to be the best so as to get the best results. Hi, My name is Adesanmi Adedotun. I made 28 awesome comments. Hello, My name is Harleena Singh. I dropped 21 awesome comments. Hi, My name is Ammar Zeb. I made 14 awesome comments. Hello, My name is Vineet Saxena. I dropped 12 awesome comments. Hello, My name is Kuldeep Biswal. I dropped 12 awesome comments. Hi, My name is Babshaybell. I made 11 awesome comments. Hello, My name is Swapnadip Chakraborty. I dropped 11 awesome comments. Hello, My name is Danyal. I dropped 11 awesome comments. Hi, My name is Philip Verghese Ariel. I made 9 awesome comments. Hi, My name is Carol Amato. I made 8 awesome comments. Hello, My name is Emebu. I dropped 8 awesome comments. Hi, My name is Sayyed Shahbaz Ali. I made 7 awesome comments. Hi, My name is Victor Noah. I made 7 awesome comments. Hi, My name is Rohan Bhardwaj. I made 7 awesome comments. Hi, My name is Mohd Arif Khan. I made 7 awesome comments. Hi, My name is Joy Healey. I made 7 awesome comments. Hi, My name is Suprabhat Mondal. I made 7 awesome comments. Hi, My name is Nisha Pandey. I made 6 awesome comments. Hi, My name is Ravi Chahar. I made 6 awesome comments. Hello, My name is Rahul. I dropped 6 awesome comments. Hello, My name is Adrienne. I dropped 6 awesome comments. Hi, My name is Karmakar. I made 6 awesome comments. Hello, My name is Areesha Noor. I dropped 6 awesome comments. Hi, My name is Divyansh Peswani. I made 5 awesome comments. Hello, My name is RahulB. I dropped 5 awesome comments. Hi, My name is Nathaniel Kidd. I made 5 awesome comments. Hello, My name is Brittany Bullen. I dropped 5 awesome comments. Hi, My name is maxwell ivey. I made 5 awesome comments. Hi, My name is Sanjay Sajeev. I made 5 awesome comments. Hi, My name is Norbert. I made 5 awesome comments. Hi, My name is Oloyede Jamiu. I made 5 awesome comments. Hi, My name is Yvonne I. Wilson. I made 5 awesome comments. Hi, My name is Angela McCall. I made 4 awesome comments. Hello, My name is Virendar Warwal. I dropped 4 awesome comments. Hello, My name is Jackson Nwachukwu. I dropped 4 awesome comments. Hello, My name is Reginald. I dropped 4 awesome comments. Hi, My name is Don Purdum. I made 4 awesome comments. Hello, My name is Nikhil Ganotra. I dropped 4 awesome comments. Hi, My name is bbrian017. I made 4 awesome comments. Hi, My name is Yashraj Kakkad. I made 3 awesome comments. Hi, My name is Nanda Rahmanius. I made 3 awesome comments. Hi, My name is Sue Anne Dunlevie. I made 3 awesome comments. Hi, My name is Mark. I made 3 awesome comments. Hi, My name is MSI Sakib. I made 3 awesome comments. Hello, My name is shamsudeen. I dropped 3 awesome comments. Hello, My name is Erik Emanuelli. I dropped 3 awesome comments. Hi, My name is Darragh McCurragh. I made 3 awesome comments. Hi, My name is Sherryl Perry. I made 3 awesome comments. Hi, My name is donna merrill. I made 3 awesome comments. Hi, My name is Mi Muba. I made 3 awesome comments. Hi, My name is lakshman Teja. I made 3 awesome comments. Hi, My name is Bilal Khan. I made 3 awesome comments. Hello, My name is Nitin Singh. I dropped 3 awesome comments. Hello, My name is Shameem. I dropped 2 awesome comments. Hi, My name is Siraj Wahid. I made 2 awesome comments. Hello, My name is Aditya Nath Jha. I dropped 2 awesome comments. Hi, My name is yogesh. I made 2 awesome comments. Hi, My name is Gautam Sehgal. I made 2 awesome comments. Hello, My name is Chery Schmidt. I dropped 2 awesome comments. Hello, My name is Pankaj. I dropped 2 awesome comments. Hi, My name is Rahul Kashyap. I made 2 awesome comments. Hi, My name is Monika Sharma. I made 2 awesome comments. Hi, My name is Manik. I made 2 awesome comments. Hello, My name is Mindy Koch. I dropped 2 awesome comments. Hello, My name is Pawan Kumar. I dropped 2 awesome comments. Hello, My name is Kevin Duncan. I dropped 2 awesome comments. Hi, My name is Edward Thorpe. I made 2 awesome comments. Hello, My name is Edwin. I dropped 2 awesome comments. Hi, My name is Jennifer Abel. I made 2 awesome comments. Hi, My name is Rahul Patel. I made 2 awesome comments. Hi, My name is Irfan. I made 2 awesome comments. Hello, My name is Jakarri Demery. I dropped 2 awesome comments. Hello, My name is Mukesh Mali. I dropped 2 awesome comments. Hi, My name is Sylviane Nuccio. I made 2 awesome comments. Hi, My name is Akaahan Terungwa. I made 2 awesome comments. Hello, My name is Lorraine Reguly. I dropped 2 awesome comments. Hi, My name is Akshit Wadhwa. I made 2 awesome comments. Hello, My name is faheen. I dropped 2 awesome comments. Hi, My name is Funmy Kemmy. I made 2 awesome comments. Hi, My name is Glenys. I made 2 awesome comments. Hello, My name is SANDESH CHAUHAN. I dropped 2 awesome comments. Hi, My name is Lawrence. I made 2 awesome comments. Hello, My name is Kushal. I dropped 1 awesome comment. Hello, My name is Zachary (QuickMeUps.com). I dropped 1 awesome comment. Hello, My name is Richard Martin. I dropped 1 awesome comment. Hello, My name is Ryan Biddulph. I dropped 1 awesome comment. Hello, My name is Nimisha. I dropped 1 awesome comment. Hi, My name is Philip Verghse Ariel. I made 1 awesome comment. Hello, My name is online business coach. I dropped 1 awesome comment. Hi, My name is srinivas. I made 1 awesome comment. Hi, My name is Rahul Suresh. I made 1 awesome comment. Hi, My name is Abhishek Abh-i. I made 1 awesome comment. Hello, My name is Liz McGee. I dropped 1 awesome comment. Hello, My name is View Nigeria. I dropped 1 awesome comment. Hi, My name is David John. I made 1 awesome comment. Hi, My name is Justin Arndt. I made 1 awesome comment. Hello, My name is Kaustav Banerjee. I dropped 1 awesome comment. Hello, My name is Md. Hamim Mondal. I dropped 1 awesome comment. Hello, My name is mrunmay phanse. I dropped 1 awesome comment. Hello, My name is wajahat zaidi. I dropped 1 awesome comment. Hi, My name is Philip V. Ariel (. I made 1 awesome comment. Hi, My name is Sarmista Aun. I made 1 awesome comment. Hi, My name is lakkolmahendra. I made 1 awesome comment. Hi, My name is Benson Wright. I made 1 awesome comment. Hello, My name is SmithLopez. I dropped 1 awesome comment. Hello, My name is mobile news. I dropped 1 awesome comment. Hi, My name is Valli Pandy. I made 1 awesome comment. Hi, My name is Aqib Shahzad. I made 1 awesome comment. Hi, My name is Chanda vivek. I made 1 awesome comment. Hello, My name is Steven J Wilson. I dropped 1 awesome comment. Hi, My name is sandra. I made 1 awesome comment. Hi, My name is supreeth bharadwaj. I made 1 awesome comment. Hello, My name is Prateek Bansal. I dropped 1 awesome comment. Hello, My name is sam. I dropped 1 awesome comment. Hello, My name is Vinay. I dropped 1 awesome comment. Hi, My name is Lisa. I made 1 awesome comment. Hi, My name is Bren Lee. I made 1 awesome comment. Hi, My name is Andrew M. Warner. I made 1 awesome comment. Hello, My name is Emmanuel. I dropped 1 awesome comment. Hi, My name is Ashok. I made 1 awesome comment. Hello, My name is Larry Frank. I dropped 1 awesome comment. Hi, My name is Ferdinand Chinedu. I made 1 awesome comment. Hello, My name is Neamat Tawadrous. I dropped 1 awesome comment. Hi, My name is Kay. I made 1 awesome comment. Hello, My name is Catherine. I dropped 1 awesome comment. Hi, My name is kartik. I made 1 awesome comment. Hello, My name is ram. I dropped 1 awesome comment. Hi, My name is Lonnie Hoover. I made 1 awesome comment. Hi, My name is YourFriend. I made 1 awesome comment. Hello, My name is Abdul Ghani. I dropped 1 awesome comment. Hello, My name is Robinsh. I dropped 1 awesome comment. Hi, My name is Sumit Thakur. I made 1 awesome comment. Hi, My name is owuogba. I made 1 awesome comment. Hello, My name is Palla Sridhar. I dropped 1 awesome comment. Hello, My name is Peter Kanayo. I dropped 1 awesome comment. Hi, My name is Pishang. I made 1 awesome comment. Hello, My name is rakesh kumar. I dropped 1 awesome comment. Hello, My name is Suresh. I dropped 1 awesome comment. Hello, My name is Pawan. I dropped 1 awesome comment. Hello, My name is Sherman Smith. I dropped 1 awesome comment. Hi, My name is Main Uddin. I made 1 awesome comment. Hi, My name is Juliana Onwumere. I made 1 awesome comment. Hi, My name is paul. I made 1 awesome comment. Hello, My name is vandefan. I dropped 1 awesome comment. Hello, My name is Pritam Nagrale. I dropped 1 awesome comment. Hello, My name is Rashed. I dropped 1 awesome comment. Hi, My name is Victoria Virgo. I made 1 awesome comment. Hi, My name is Majharul Hossain. I made 1 awesome comment. Hi, My name is Ankit Singla. I made 1 awesome comment. Hi, My name is Gaurav Jaggi. I made 1 awesome comment. Hello, My name is Amit Kumar. I dropped 1 awesome comment. Hello, My name is Rahul Yadav. I dropped 1 awesome comment. Hi, My name is Siddharth Sharma. I made 1 awesome comment. Hello, My name is Wendy Ewurum. I dropped 1 awesome comment. Hello, My name is Soumyakanti Ray. I dropped 1 awesome comment. Hello, My name is Andrew. I dropped 1 awesome comment. Hi, My name is Govind Choudhary. I made 1 awesome comment. Hi, My name is Ernest. I made 1 awesome comment. Hello, My name is Fidelis Ozuawala. I dropped 1 awesome comment. Hi, My name is Uju Uduma Ikpa. I made 1 awesome comment. Hi, My name is Haider Ali. I made 1 awesome comment. Hi, My name is Aditya. I made 1 awesome comment. Hello, My name is Inzamam. I dropped 1 awesome comment. Hi, My name is Akintunde. I made 1 awesome comment. Hello, My name is adesanya. I dropped 1 awesome comment. Hi, My name is Eedris Saminu. I made 1 awesome comment. Hi, My name is adam. I made 1 awesome comment. Hello, My name is ghousebasha. I dropped 1 awesome comment. Hi, My name is Adam Binder. I made 1 awesome comment. Hello, My name is Vatsala Shukla. I dropped 1 awesome comment. Hello, My name is Dave Lucas. I dropped 1 awesome comment. Hello, My name is Jayden James. I dropped 1 awesome comment. Hi, My name is As Prince. I made 1 awesome comment. Hi, My name is Adam Connell. I made 1 awesome comment. Hello, My name is Arun Raj S. I dropped 1 awesome comment. Hi, My name is Ahana. I made 1 awesome comment. Hello, My name is Temilola Globalwalyy. I dropped 1 awesome comment. Hello, My name is Nitin mohan. I dropped 1 awesome comment. Hi, My name is Maketta. I made 1 awesome comment. Hello, My name is Adrian Lucernas. I dropped 1 awesome comment. Hi, My name is Rahul Krishnan. I made 1 awesome comment. Hi, My name is Catherine Holt. I made 1 awesome comment. Hi, My name is WebTecHelp. I made 1 awesome comment. Hi, My name is Muhammad jamshaid. I made 1 awesome comment. Hi, My name is Tfort. I made 1 awesome comment. Hi, My name is Abid Omar. I made 1 awesome comment. Hi, My name is Adesoji. I made 1 awesome comment. Hello, My name is Milind K.. I dropped 1 awesome comment. Hello, My name is Babanature. I dropped 1 awesome comment. Hello, My name is vino. I dropped 1 awesome comment. Hello, My name is Simranjit singh. I dropped 1 awesome comment. So tell us in the comment box below, what are your plans for this month of October 2014? Any tips, recommendations or advice? You’re actually doing an amazing work here. Nice to see the list.. myAuthorComment plugin is really doing great. But next I’ll make I out-rank my boss (Harleena) 😛 . Anyways, thanks for sharing and do have a happy month. Good to see my name here in the list, i was not much active this month due to my exams but i will try hard to remain active. I am totally amazed to see 500+ Comments in a single month. It is the result of your great blogging community. Thanks for Adding me in this list.. I am a part of your blogging .. Away some blogging ideas found on this site regular surely in this month do more reply by commenting on your post because i am became the regular reader of your site.. thanks.. Thanks for putting me up there again. As usual, it is a huge honor and no, I don’t comment just for it. I think you’re one hell of a blogger and I see you are growing it real big. Happy for you man! Keep up the good job and talk soon. Yea, how time really flies! I can recall vividly reading your August report few weeks back and today it’s September. As usual, the MyCommentAuthor plugin is really bringing about the much needed engagement! I am glad I was part of your blog activity in the month of September Enstine. Have a wonderful day bro. Well, plans for this month are comment less as I need to work inside my blog and grow my blog community and the forum now, and that in itself is a FULL time job! Let’s see how it goes, so if I am less over at your blog, hope you would understand too – I know you would as you face the same issues working on BroadedNet. I can’t just believed I made the list, and not just the list but being one of the top commentator of the previous month, to be frank I’m indeed amazed. To be candid with myself and this blog readers, I’m not competing with Harleena the best blog top commentator of I ever met,and not just that, she has the techniques to make things happen but I’m really emulating her when it comes to competing. Kudos to Harleena for the inspiration and thanks for the mention bro, I really appreciate it. Its great to see my name every month. Using MyAuthorComment you have do a great job by mentioning your readers. Thanks for this article. I love your blog very much because you are the true blogger who always wants to make blogging interesting your blog is a really a inspiration for your readers. I’m feeling guilty somewhere as you mentioned me in your blog but I’m not that active in commenting that I use to be earlier with my comments in every post of yours. I’m busy designing all day a week for clients you know… Less blogging & social activity and more focusing on clients. Hope you understand! But still, you doing a great job with this blog, bro. I know you since you’ve started this blog or maybe before that… all I can say you is – you are a good blogger! Thank you for including me in your September Engagement Report. Wow i was able to make a total of 5 comments in the month of September. I hope to be in the top this month. My Comment Authors plugin is awesome. I just put it to use for the first time since i installed it almost a month ago. I hope you will still add more functions to the plugin in order to make more better than it is right now. wow!! Thank you for recognizing these people because it tells me you value every one on your blog. I appreciate your concern for us. Good to know I am still in the list though I was not much active last month in commenting section though I read most of your posts. At so many other blogs I also watched this plugin is bringing great results. As a whole it is a great motivational force to invite more and more comments. No one thought before a widget would work to review the commenting performance also. This is the fascinating world of online business where everything is possible anytime. Thanks a lot for mention and also this wonderful post. Thanks for putting out awesome, share-worthy content and for including me. Thank you for the mention. I really appreciate it. I am happy that my engagement was more than the previous month. 🙂 Love your honesty and your blogging ethics. Hope to be back again soon. Hello Enstine, I can’t hardly believe it is October already it sure did sneak up on me. I truly enjoyed my email today and want to Thank YOU for mention my friend! I did download and use your MyCommentAuthors Plug in last month and actually forgot about it until I received your e-mail. Like I said this month kind of just slipped on by me.. Thanks for sharing your article. It’s a great post. Congratulations on your monthly engagement. I hope one day my name will appear above. Just hoping for it. I had fun reading and many great insights here. I am happy to see your email about my comment on your blog. Although I am only 3 comments last month but quiet happy to see your commentators list. It’s a fantastic way to boost your engagement with your readers. In every step I am learning something new from you. Thank you Enstine, but do you know that you did not even dropped one comment in some of your commentors blog, to me this make you a selfish man, pls stop selling fish ooooo. WOW I guess I’ll have to wish you for your great work. I guess you’ve put your lot of efforts in achieving these stats. I am so glad that you have liked my analysis report… It is a huge motivation for me…. Thanks for the mention. I will improve my engagement this month as I was little busy last month. This is a great plugin. I am also using in my blog and soon, will announce the commentators. My goodness look at all these people! You are doing a great service for others and the “poster guy” of what blogging is all about. I’ve been so busy with product creation, and coaching. Thank goodness I didn’t do a launch because I would have to be hiring people right now lol. I had no idea how fast my business would grow. The month of October starts with rolling out a new webinar, doing my weekly Q & A sessions, and keeping up with my coaching clients. It is such a pleasure working with people that want to do the marketing part of their business. It is like a giant puzzle to put together with each person to get them up and running. Phew… And I blog too lol. Thank you for the mention inside of your blog and will be stopping by more often. I actually signed up broaded.net a couple weeks ago and really started using it today; then even set up a couple of campaign. Sorry it took so long the ping got sent to the spam folder, because I was getting so much of it inside of my blog. I did not realize after your site starts getting a little more traffic spammers just come out from everywhere, but thanks again for the mention in the post. Congratulations Enstine, This is amazing & such a wonderful A small part of Success ! I didn’t ever notice & see this kind of wonderful achievement in any other Blog ! Hey Enstine, the list is really great. There is no such blogger (till now I didn’t saw) who had shared such data about their readers.. This is really a great way to keep them with yourself and loyal. Ohh.. I didnt make it on the list. Hope I will be there this month. Thanks Enstine for adding me into this list. I m very happy to be here and I will try my best to do more comments on your blog to be on the Top Commentators. This is my first time coming to your blog. I first found you through Donna Merrill’s blog and then I also read about your MyCommentAuthors plugin through Chery Schmidt! I was so amazed by all that this plugin does! What a fabulous concept. Of course, I just had to install it so I can’t wait to thank my comment authors like you do here. Everyone likes recognition for their time and efforts. I’m really looking forward to getting to know you better and to see this plugin work for my commenters. Thank you for creating such a valuable tool for bloggers everywhere! Have you also checked out my new blog promotion platform broaded.net ? Thank you so much Enstine! I just got it all set up, it was quick and easy! I plan on doing a post about it as well. No I have not checked out broaded.net. I’m just getting my blog going but of course, if it’s connected to you, it’s worth taking a look-see! Thanks again, I sure appreciate it! Thanks for sharing this cool list of all commenting blogger! You are a great blogger for sure with some tremendous kind of stuff, as i always believe! This was one of the good examples! What a great way to rewards your commenters. This is my first visit on your blog. I really love it. Hope to visit it soon.